Introducing a Car Coloring Book i.e., fun, simple and educational for all ages with over 100+ coloring pages. The coloring pages are very attractive for adults and kids. 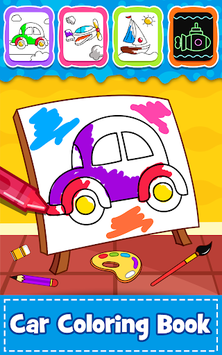 Color the Cars Coloring on your phone or tablet. Coloring game of Doodling, painting, & drawing app for children with free coloring pages on Android now! Children Play and Learn Cars, Airplanes, Boats, Jets, Shapes, Colors, Transport Vehicles, Toys, Glow Coloring for fun. Let's gather everyone in your family to play with our coloring pages app. 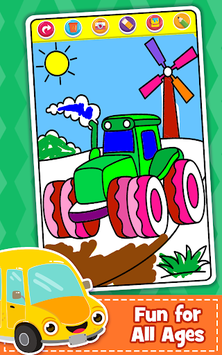 This game will develop your child's creativity, imagination and toddler draw skills. Kids colouring book is the best drawing game for kids! PreSchool Coloring games for toddlers is fun learning. 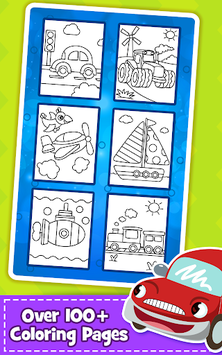 Kids coloring app for toddlers help to draw, shapes, color and draw cars with glow doodle with colorful brushes, crayon, glitters & patterns. A family colouring book. This free Coloring book for kid or Kids Doodle game is designed for toddlers coloring and babies coloring. Coloring games for boys and girls is one of the best apps for children & best painting games with Fun Drawing, Learning Games, Animals Coloring Pages for toddlers with Free games to play. A family game.